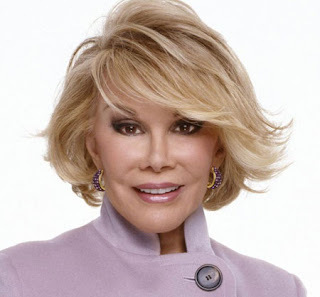 A seminal stand-up comedian who found her greatest success as a talk show host, Joan Rivers was born Joan Alexandra Molinsky on June 8, 1933. The daughter of a successful physician, she spent her youth in Brooklyn and Larchmont, New York. In 1954, Molinsky graduated Phi Beta Kappa from Barnard College, where she performed in many school productions. Although she craved a show business career, she instead worked in the fashion industry. While a fashion coordinator for the Bond clothing stores, she married her boss’s son, James Sanger. The marriage was annulled six months later. Against her parents’ wishes, Molinsky quit her job and began performing stand-up comedy in New York clubs under the name Joan Rivers. Supporting herself with secretarial work, she spent seven years on the club circuit with little success. Her big break finally came when she landed a spot on The Tonight Show in 1965. Four months later, she married producer Edgar Rosenberg. They had a daughter, Melissa, in 1968. Throughout the 1960s and 1970s, Rivers was a frequent guest on The Tonight Show and other variety and talk programs. She helped pioneer the daytime talk show as the host of the short-lived That Show (1968–69). Rivers also tried writing for the stage and screen. She coauthored the unsuccessful Broadway play Fun City (1972) and wrote the television movie The Girl Most Likely o . . . (1973). Rivers and Rosenberg mortgaged their house to help finance Rabbit Test (1978), a film comedy cowritten and directed by Rivers. To her disappointment, the movie received mediocre reviews. She had better luck with the humor book The Life and Hard Times of Heidi Abromowitz (1984), which became a best-seller. She has since written two well-received autobiographies and several self-help books drawing on incidents in her own life. In 1983, Rivers became the permanent guest host of The Tonight Show, often drawing better ratings than its regular host, Johnny Carson. She was particularly hailed for her monologues. Early in her career, she relied heavily on self-deprecating humor (“I was such an ugly baby a furrier tried to club me”). As her star rose, she increasingly made the rich and famous the targets of her one-liners. Rivers was especially ruthless in her humorous attack on ELIZABETH TAYLOR’s weight gain (“Mosquitos see her and scream ‘Buffet’”). She once explained her brand of comedy, saying “I am telling the truth in a very angry age. . . . And I succeed by saying what everyone else is thinking.” Lured by a $3 million contract from the fiedging Fox network, Rivers became the host of her own late-night talk show, The Late Show Starring Joan Rivers, in 1986. The show failed, and soon afterward her husband suffered a nervous breakdown. He committed suicide in 1987. Adding to her sorrow, Rivers found herself nearly broke because of bad investments and watched her relationship with her daughter Melissa deteriorate. She later chronicled this difficult time in the television movie Tears and Laughter: The Joan and Melissa Rivers Story (1994), in which she and Melissa Rivers played themselves. 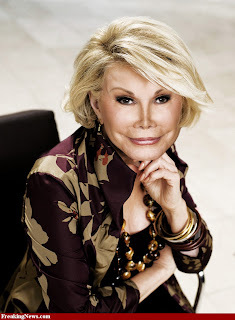 Rivers returned to television in the syndicated The Joan Rivers Show (1989–94), for which she won a 1990 daytime Emmy Award as best talk show host. In 1989, she also began designing and selling her own line of jewelry on the QVC cable shopping channel, an enterprise that has greatly improved her financial situation. In the 1990s, Rivers started appearing on E!, a cable entertainment news network. Since 1994, she has hosted E!’s most successful program—a pre–Academy Awards show during which she and Melissa offer humorous remarks about movie stars’ sense of style or lack thereof. Rivers, Joan, with Richard Meryman. Enter Talking. New York: Delacorte, 1986. ———. Still Talking. New York: Turtle Bay Books, 1991. Joan Rivers: Abroad in London (1992). Paramount, VHS, 1995. Joan Rivers ’ Shopping for Fitness (1996). ABC Home Video, VHS, 1996.